Technical Analysis is the technique of predicting future price action of a security in the financial markets. It is by analysing the past price action of that security.Analysis is done by using the technical charts and the technical indicators. From the beginning,the traders have been using Technical Analysis for deciding their entry and exit prices for a trade. It was even though doing Technical Analysis was not that easy in those times.But in today’s world of advanced technology,Technical Analysis have become so easy and innovative. Any person interested in markets can learn and implement this technique easily for his or her trading purposes.All you need is a computer with internet connection and a Technical Analysis software. Prices Move in Trends – According to this premise,security prices move in a trend and tend to stay in that trend until it is changed or reversed.Trend may be an uptrend,a downtrend or a sideways move. Based on that information,the future price action for a security is predicted by Technical Analysis while assuming that the current trend shall continue in that direction. Markets Discount Everything – This is based on the assumption that any event,be it a news or business/corporate activity, is already reflected in the current security prices.Those things are already known to the markets. It is assumed that they are unlikely to effect the market prices when they become known to everyone. History Repeats Itself – This is also the basic thing in Technical Analysis and help us in taking well informed trading or investing decisions.A stock or a security taking support or resistance at particular price level in past is expected to behave the same way in future also unless it is violated in a convincing way. If a stock reaches near its support level in a market fall,the traders tend to buy it around those levels expecting the support level to hold and prices to rise from that level.Same is true for the resistance levels. A Technical Charts is the graphical representation of the past price moves of a security which it shows while it is trading on the exchange.You can get chart for any period for a security or depending upon the data available for the trading history of that security.It can be a hourly,daily,weekly,monthly,quarterly or yearly chart.You can even get chart by ticks or minutes also. There are four types of Charts which an analyst can use to analyse the security – Line Charts , Mountain Charts , OHLC Charts and Candlestick Charts.Out of these, Candlestick Charts are the most popular among the traders. Read more about Technical Charts. While studying these charts,We look for the formation of certain specific patterns over a time period which can be minutes,hours,days or weeks.The longer the time period we select,the longer the pattern takes to form and achieve the targets. There are several types of charts patterns. The popular and easy to spot among them are Triangles,Wedges,Double Tops & Bottoms and Head & Shoulders Patterns. Read more about Chart Patterns. These are formed for a very short term,mostly for a single candle of a chart.This candle can be representing the trading action of an hour,day,week ,month,quarter or year. This just shows the psychology of majority of the traders.These are named as Hammer,Inverted Hammer,Shooting Star,Bullish or Bearish Engulfing etc. Read more about Short Term Candlestick Patterns. 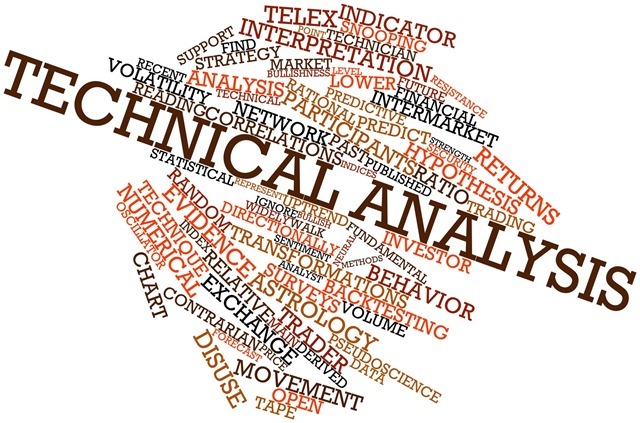 Technical Indicators are a set of tools which we apply on a chart when studying it.They are very important for taking trading decisions as they give more precise entry and exit price levels for a trade.Indicators can be Leading or Lagging Indicators.A Leading Indicator gives trading signal before the security turns in predicted directions. Lagging Indicators give signal after the security has started to move. In case of Lagging Indicators,some profit potential may be lost but they remain more reliable as compared to Leading Indicators which may give false signals.All Moving averages , simple or exponential, are Lagging Indicators while Oscillators act as Leading Indicators.Support and Resistance are also important indicators without which you can not imagine successful trading. Technical Oscillators are also a type of Indicators and they keep oscillating between ranges and thus giving Entry or Exit signals at the extremes of the range.These are Leading Indicators and we can get a buy or sell signal far earlier than the security actually starts moving. As we mentioned earlier,probability of going wrong with them remains there. They include Stochastic,Relative Strength Index ( RSI ) , Momentum , Bollinger Bands , Average Directional Index and many more.